GeForce GTX690 in Stock Checker and Locator. ASUS and Evga cards. Released in June 2012, the GeForce GTX690 is currently in short supply throughout the US due to limited supplies of the GK104 chip which is required for both of Nvidia’s latest generation cards (the other being the GTX680). Below you will find the latest real-time availability and by registering you can also receive email and cell phone text alerts when stock is located. Just leave this webpage open, with alerts enabled, to ensure you are the first to know when stock is found. NVIDIA's fastest graphics card to date, the Geforce GTX690 incorporates new architecture with dual GPU processing power to provide a superior gaming experience. Main features of this amazing card include the latest dual 28nm GPU (Graphics Processing Unit) and 4GB GDDR5 4096MHz memory (Graphics Double Data Rate, version 5). The GPU core runs at a blistering fast 1019MHz in boost clock and the energy efficient 28nm manufacturing of the GPU ensures lower energy consumption and bills. There are only two manufacturers offering this graphics card in the US, ASUS and EVGA. Exclusive to the ASUS model is a GPU tweak facility, whereby overclocking is available in real-time allowing you to experiment and optimize GPU clock speeds, fan speeds and voltage on up to four separate graphic cards. Built-in safe guards are included which ensures that all modifications are safe and will not damage the card. In game HD video recording is also enabled with resolutions up to 720p. The card uses the PCI Express 3.0 slot which provides it with double the bandwidth of a PCI Express 2.0 interface for faster communication between the card GPU and computer CPU. We constantly check for GeForce GTX690 stock, so you don't have to. 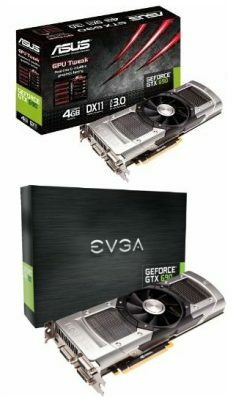 Receive email alerts when GeForce GTX690 online stock is found.